Chefy and I love receiving new music to review and were very happy to receive The Unmaking by Nichole Nordeman! This CD has only 6 songs, but it is a very strong and meaningful CD. The title song is one of my favorites, because it completely explains how you need to let go and let God. There is not a single song on this CD that we dislike! I would much rather have a quality 6 track CD than a poor 12 track CD! 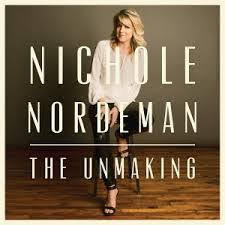 Nichole Nordeman is a recording artist and songwriter for Sparrow/EMI CMG, with numerous number-one and top ten singles to her credit and cumulative CD sales of over one million. A two-time Gospel Music Association winner for Female Vocalist of the Year, she has won a total of nine Dove Awards, including the best-selling album, Music Inspired by The Story. Her best-known songs include "Holy", "Legacy", "Brave", "This Mystery", "Why", and "What If". She lives with her family in Tulsa, OK.
Would you like to win a copy of this wonderful CD for yourself? Simply enter on the rafflecopter form below! Only one entrant per mailing address, per giveaway. If you have won a prize from our sponsor Propeller / FlyBy Promotions in the last 30 days, you are not eligible to win. Or if you have won the same prize on another blog, you are not eligible to win it again. Winner is subject to eligibility verification. I don't listen to Christian music, but my sister does. I would give her this CD. I love Christian music.. I grew up listening to it all the time in the car. My favorite artists are TobyMac, Needtobreathe and Francesca Battistelli. I like and listen to Christian music, I like Steve Camp, older I know but he has good songs. I don't listen to Christian music, I would like to win those for my Dad who does though. I love Christian music. Some of my favorites include Nichole, Francesca Battistelli, and Matthew West. I really enjoy Christian music, but it's hard to pick a favorite. I love being able to play music with my kids around and not worry about what the lyrics are saying. I have special needs children & we listen to all types of music including Christian. We love Toby Mac.